We had Sports day on 15th Dec. in Sakurajima. This is one of our regular event. We played Soccer, Basketball, volleyball and ping pong in Sakurajima and also Leg ONSEN after sports^^ It was very beautiful day and we enjoyed. One of the big festival in Kagoshima was held on 2&3 Nov.It's OHARA Festival. We enjoyed the festival together. シティービューツアーに行きました！City view tour for new students! 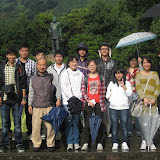 New students took a trip with classmates 'Kagoshima city view tour' on 28th Oct. They visited some sightseeing places by bus and discovered something new! !